Connect directly to any XR440 or XR5-SE Data Logger; no external power required. For high and low side refrigeration and air conditioning systems, chilled water, hot water, air, gas, oil and steam pressure. Stocked ranges from 0-30 to 0-20,000 psig, and compound ranges from Vacuum-30 to Vacuum-300 psig. See table below. Log up to four (4) pressures with one XR440 Data Logger, and up to eight (8) pressures with one XR5-SE Data Logger, for a multi-channel, battery powered pressure recorder requiring no external power. Mechanical Vibration Random vibration 20g over temperature range (-40 to 125°C). Exceeds Typical MIL. STD. Requirements. 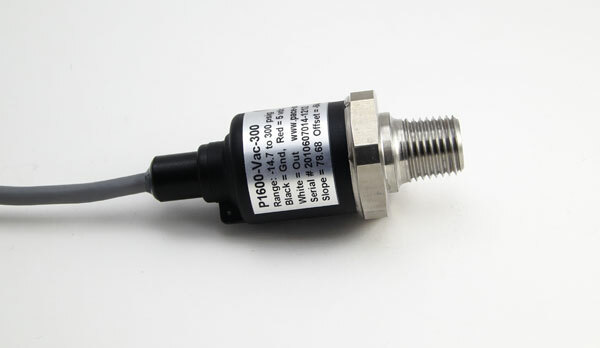 P1600 Sensors can be read in any pressure unit (psi, kPa, bar, etc. ); see XR440 Pressure Converter or XR5 Pressure Converter. The 10 FT (3 meter) cable on all P1600 Pressure Sensors may be extended up to 100 FT (30 meters) by the user using three conductor 22 gage cable. In electrically noisy environments we recommend using shielded cable. Pace Scientific develops Data Loggers, Sensors and Software since 1991. © 1996-2016 Pace Scientific Inc. All rights reserved.